"The city of Champanir is a purely Moslem place, originally built by one of the Rajput princes. The fortress on the hill above is a wonder to soldiers. From the perpendicular scarp of the cliffs it was almost impregnable, but it is now entirely deserted, except by tigers! I was warned not to linger about after sunset, as they were apt to come close after dark...The road up the hill was wonderful, passing through at least a score of curious old gates and along natural ledges of rock hanging over perpencicular precipices. Half-way up we stopped to see the old granary, with five-domed rooms; much of the ascent being a staircase cut in the solid rock. When we reached the great flat top it was strewn all over with small Hindu temples of the richest stonework, but all tumbling about as if they had been the victims of earthquakes. Above that rose the upper mountain - a sheer perpendicular scarp, with a most lovely marble temple and two lantern towers on its summit...The views over the great blue plain, distant sea, and hill-country, were extensive and lovely, and I was quite sorry when the time came to descend." 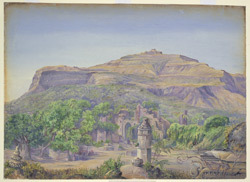 The city of Champanir was established by the Gujarati sultan Mahmud Begarha following his capture of the nearby Hindu fortress in the later fifteenth century. It was an important administrative centre until the Mughal annexation of Gujarat the following century.